This is as pretty as they get. I've had the weekend to think about the new rules, how they'll affect the game, and the quality of Games Workshop's eBook editions. First off, the changes to army composition. My mind literally cannot comprehend what it's going to do. It's too busy being inordinately excited about the possibilities. Unbound armies? You can run an old school Inquisitor with Storm Troopers leading squads of Sisters and Grey Knights with Storm Talon support. The possibilities are intoxicating. Yes, I'm thinking of having a small troupe of Inquisitors driving a swarm of Tyranids at their opposition. ALL OF THAT IS POSSIBLE NOW. But what's crazier is that you can do these combinations as Battle-Forged armies as long as you fill out the Detachments. There are no limits on the number or types of Detachments you include in a Battle-Forged army. Inquisitors have an extremely light Detachment requirement. It can simply be a single Inquisitor. Or you can have them as part of a GK Detachment. A Canoness with a squad of Battle Sisters fills an Allied Detachment. Storm Troopers? I haven't looked into the Militarum Tempestus codex, but it likely has a small Detachment included to allow you to add them to larger armies. Storm Talons a little trickier, but Throw a SM Captain and some Tac Marines in and you can add them. To a fluff gamer, the changes are an amazing boon. To a WAAC player, they are as well, however there is an important caveat one must consider: the rule book itself says that players need to agree on limitations on unit numbers, composition, etc. When it comes to tournaments, expect specific restrictions on Force Organization. When playing friendly games, play friendly. Just because the rules technically allow you to field all the most overpowered unit combinations you muster . . . don't expect others to ever play against them unless that's what they're looking to fight. In addition, the Psychic Phase will change things tremendously. Sam will likely discuss it in more depth, but I do like what it does for the game. I've never been one to really deal with running Psykers of my own, but if I get in some games in the future, that'll likely change. I mean, I'm a Grey Knights player. They're Psykers all over . . . after the last codex. Incidentally, my last game was shortly before it dropped. I even own a couple Dread Knight boxes, but I haven't gotten around to putting them together. But back to the point, the Psychic Phase sounds like it consolidates and limits some of the crazier things that were being done with Psykers. Eldrad cannot Fortune everyone 4 times a turn. Speaking of Grey Knights and the Psychic Phase, the Aegis now does nothing as Sam brought to my attention. It reduces the Leadership for Psychic tests . . . but Leadership is no longer involved for Psychic tests. I put forth the idea of it cancelling a hit on the test or making hits only on 5+, but that seems awfully effective . . . probably too effective. Sam thought it could give Adamantium Will, but I thought that was a bit too close to what the Sisters do (in fact, they nearly all get it through their Shield of Faith). Which leads us to a gap in how the Sisters operate with the new Psychic Phase. Deny the Witch, a Sisters specialty, is based on spending Warp Charges. Since the Sisters have a grand total of ZERO Psykers in their list, they get a grand 1d6 Warp Charges to spend on Deny the Witch rolls. This is a bit weak. My solution is to give the Sisters this rule: "Every Unit with the Act of Faith Special Rule is treated as having Mastery Level 1 for purposes of Warp Charge generation." Why Act of Faith instead of Shield of Faith? Simple: it prevents vehicles from generating charges. I purchased the eBook edition of the 7th Edition rules. 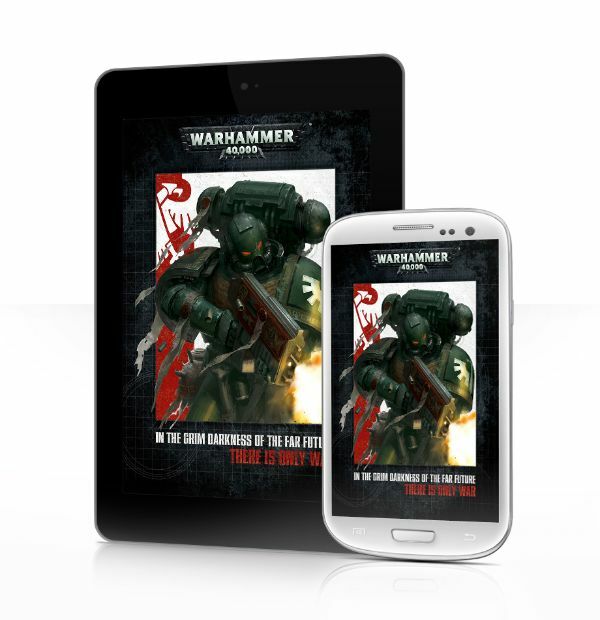 As beautiful as Games Workshop's physical books are, their eBooks are awful. I have no experience with the enhanced iPad edition, so they are likely better. Perhaps it is merely a limitation of the formats they use. I have several PDF copies of Paizo's Pathfinder books. They're virtually identical to print copies. The same applies to PDFs of White Wolf / Onyx Path games. Really, it applies to pretty much every other company out there that sells electronic copies of their rules. GW, however, sells the books only in ePub and Mobi formats. Formats designed for straight text. The artistry of the book layout and design is simply lost. Which is truly sad. While GW may make terrible business choices at times, their products are definitely top notch. I cannot say that about their eBooks. A lot of the new rules aren't very new. Other than a few major changes such as the Psychic Phase, it's sometimes hard to tell where the rules deviate from 6th Edition. It's not too hard to get the feeling that FAQs and errata would get us to the same spot. In a way that's not a bad thing. transitioning from 6th to 7th will not be difficult. I truly love the opportunities that the revised army composition rules allow. The bad part is that some of my favourite armies need some errata to work better in the new paradigm. And GW really needs to start providing good PDF versions of their eBooks.